The current version was updated on 6/11/2017 by: Americo and Fabiola Esquibies, Carlos Balarezo, Marlene Mesta, Armando Zarazu and Alfonso Enriquez. We, a group of individuals with a common interest in the Hispanic Culture, residents of the United States of America, establish the following as the basis of our Constitution to form a better cultural and human union and relation among us. 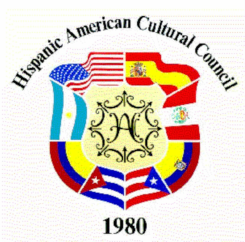 The name of this association shall be "Hispanic American Cultural Council" or "Concilio Hispano Americano de la Cultura". The Council is organized exclusively for charitable, literary, artistic, and educational purposes and to foster national or international amateur sports competition, as specified in section 501(c) (3) of the Internal Revenue Code of 1954, and shall not carry on any activities not permitted to be carried on by a corporation exempt from Federal income tax under section 501(c) (3) of the Internal Revenue Code of 1954. As a 100% charitable nonprofit organization, none of the members and officers receives any monetary compensation. The Council shall be supported by membership fees, donations and monies derived from fund raising, grants, and social/cultural activities. The Official Logo of this organization, which appears at the end of this Constitution, shall be affixed to all official documents of the Council. The Council shall consist of the following categories of members: Organization, family, and individual members. The management and administration of the Council shall be vested in the Executive Board, the Board of Directors, and the General Membership, the latter when they are called for ad hoc meetings. The Council will hold not less than three other meetings each year in addition to the annual meeting and special meetings whenever necessary. Election of the members of the Executive Board and the Board of Directors shall take place every two years. The general assembly of the Council shall approve the Bylaws of the organization. All rules shall be based on the general principles and bases established in this Constitution. The Council has neither political nor religious affiliation. Religious or political discussions shall be avoided at any meeting or activity of this organization. The affirmative vote of two-thirds of the General Active Membership of the Council, present​ or by absentee vote or by a well-documented e-mail process approved by the Boards ​is required to amend or modify this Constitution. The General Membership shall be notified two weeks before the meeting of the proposed change or amendment of this Constitution. The legal name of this association shall be the "Hispanic American Cultural Council (HACC)." In Spanish "Concilio Hispano Americano de la Cultura (CHAC)." To promote all aspects of the Hispanic culture through the arts, education​, and cultural/social events to preserve the Hispanic heritage. As a 100% charitable nonprofit organization, none of the members and officers receives any monetary compensation. To​ comply with the Internal Revenue Service codes, the HACC is structured exclusively for charitable, religious, educational, and/or scientific purposes, included, for such purposes, the making of distributions to organizations that qualify as exempt organizations under section 501(c)(3) of the Internal Revenue Code, or corresponding section of any future federal tax code. SECTION 1. Membership in the Council shall be comprised of organizations and individuals interested in the Mission and purposes of the Council. possess appropriate credentials, which will be kept on file by the Secretary of the Council. SECTION 3. Family members are parent(s) and dependent children supporting the Mission and Purposes of the Council. SECTION 4. Individual members are persons, supporting the Mission and objectivs of the Council. SECTION 5.​There shall be a Membership Committee. See Article Eight. ·​ Intentionally​ and repeatedly failing to comply with the Constitution and its Bylaws. This procedure can be presented to any of the members of the Executive Board in the following order President, Vice-President, Secretary, Treasurer or Trustees. SECTION 1. The Membership Committee shall recommend once a year the revision of the Annual Dues for each class of membership to the Executive/Director’s Board to be applied the following Calendar Year. SECTION 2.​Annual Dues must be paid to be considered an Active Member. SECTION 3. No annual dues, or any part thereof, shall be refunded in the event the Council ceases to function or exist. See also Article 11 Section 5. The Executive Board, and 2. Its Board of Directors. SECTION 1. The Executive Board shall be comprised of a President, Vice-President, Secretary, Treasurer, and two Trustees. It shall have all the powers and obligations vested in this Constitution. SECTION 2. The Executive Board following the Elections shall serve for a term of two years or until their successors shall qualify. Establishing the committees which it may deem necessary with such powers as it may authorize. Ensuring​ all the Committee responsibilities will be fulfilled. Designating​ the bank or banks in which funds of the Council shall be deposited. Determining​ the manner in which checks, drafts and other financial instruments of the Council shall be executed. Ensuring​ meetings are held per the established schedule. Complying​ with Federal and State tax statutes. Acting​ on behalf of the Council and the Board of Directors between their meetings. Making​ applications to receive public and private grants for the purpose of furthering the Council’s arts, education, cultural and social activities. Attending​ most of the Regular meetings each year and its failure will result in their replacement at discretion of the Executive Board. Taking​ care of disciplinary complaints and procedures, like receiving the written and duly signed complaint, creating a temporary committee to deal with it and executing its recommendations (call to order, warning or impeachment). Serve as ex-officio member of any committee if desired, except in the Nomination Committee, where he or she has no voting rights. Responsible for his or her Final Report at the end of his or her presidency. If not involved, he should conduct the disciplinary procedures incited by the written complaints of the active members..
Should the President be absent, he or she shall be represented by one of the members of the Executive Board in the following order: Vice-President, Secretary, Treasurer, Trustee #1, or Trustee #2. The Vice-President acts as a substitute of the president in his absence. He or she carries out responsibilities assigned by the president or the board of directors. The Secretary ​manages the records of the organization such as correspondance, serving notices of meetings, posting agendas, maintaining minutes, and handling written commumications on behalf of the organization. Serve as the custodian of the organization’s funds. Pays the bills of the Council including the Post Offico Box. Performs such other duties about the office as may reasonably be requested by the Executive/Directors’ Board. Is responsible for the budget. Responsible for the Financial Statements required by the IRS or any other financial reporting institution with or without the assistance of a CPA, approved by the Board. The Trustees #1 and #2 shall have duties and powers as may be assigned to them by the President, Executive/Directors’ Board. They will be elected and designated Trustee #1 and Trustee #2 to differentiate any specific duties they may be assigned. The President, Vice President, or Treasurer will be the authorized officers to delegate responsibilities to the Trustees. A quorum for all meetings of the Executive Board shall consist of a minimum of three of its members. SECTION 1. The Board of Directors shall consist of at least eighteen positions. It will be composed of a minimum of three members on each of the 6 Permanent Committees listed in Article Eight, Section 1 below. Each​ of the member of the Boards should be elected to serve for two years. If requires, additional members can be selected by the elected Committee chair and/or nominated from the members at large. No​ person shall be eligible to serve on the Board who is not a member of the Council in good standing. SECTION 5. Since our first Council Meeting and every Elections Council Meeting thereafter, each organization member has had the right to select from its membership one representative to be known as an "Observer." The person thus chosen has the right to attend all meetings and shall continue to do so until the member organization chooses a successor to serve as Observer, replacing the previous appointee. All income and expenses will be included in the Audit. It will be for the prior calendar year. The Audit period will be a calendar based fiscal year, from January to December. Audit Committee members will be nominated or self-nominated from the general membership. The number of Audit Committee Members will be a minimum of 3 and a maximum of 5. Executive and Board of Directors will not be members in the Audit Committee. All financial inquiries will be directed through the Treasurer. The Audit Committee will present the findings of each Audit to the General Membership at the first month of the year meeting. SECTION 2. There shall be such other Committees as the Board shall deem necessary or advisable for the management and operation of the Council. Confirmed nominations obtained from the membership at large. This will produce ballots that shall be subject to confirmation by the Nominations Committee. SECTION 4. Committee Presidents should have the option to select the members of their respective committees and report to the Nomination Commitee, They also have the option to report to the Executive President those members who interfere with their work for disciplinary procedures . ​Active members can also volunteer to participate in any committee. SECTION 5. If the Council President or the Vice-President, substituting for the President, is asked by a committee or recognizes the need to attend or participate in any of the committees, he or she will participate and support that committee to achieve its objective(s). SECTION 6. In the event of a vacancy of a Committee President, its Members will nominate a replacement from that Committee’s Members or the Membership at large for the balance of that elected year. Such replacement shall be confirmed by the Executive/Director’s Board. Section 7. It is suggesed that active members should not work in more than two committees to prevent power monopoly, personality conflicts, burnout, loss of valuable associates and to allow learning opportunities for new members. SECTION 1. The Nominations Committee shall consist of three ​members including the President of the committee. The President of the committee nominated by the Executive/Directors’ Boards or the membership at large. The other two members will consist of one selected by the nominated President of the Nominations Committee and one nominated by the membership at large. SECTION 2. The Nominating Committee shall present the names of the candidates to be elected to the Executive Board and the Board of Directors As provided by Article Six, Section 2, and Article Seven, Section 1 above respectively and shall report the names of those persons to the membership at large of the Council no later than December 30th​​. Before the 1st​ week of November, the Nomination Committee must obtain from the Membership Committee the updated, active membership list. The Nominations​ Committee (NC) will accept nominations by e-mail, regular postal letter, or phone calls no later than 12/25 of the year of elections. The NC will present the roster of candidates to the membership by the 1st​ week of January. Finally, the​ election will be held during the Annual Meeting on the 3rd ​​Sunday of January. The​ Council shall hold its Elections Meeting every two years on the third Sunday of January or at such time and place as the Executive/Directors Boards shall determine. In the event of any change, notification shall be sent to the active members of the Council. At​ the end of the Elections Council Meeting the​ past and elected Executive/Directors Board shall meet to exchange files, equipment, and documents held by the previous administration. Also, set a date to exchange signatures on HACC accounts at the bank. The​ Nominations Committee’s election results. An​ annual list of all the Ordinary Meetings as well as a tentative Calendar of Activities will be presented during the February Meeting. Reminders​ of the time and place for Ordinary meetings of the Council shall be mailed to all members at least one week before to the date thereof. Each​ ​ session shall be based on the established Agenda outlined. See appendix. Agenda​ items will include: the minutes of the previous session, the reading of the correspondence, the Treasurer report, a report from each of the committees, old or unfinished business, new business, and the time and place of the next meeting. See appendix. Members​ of the General Membership may attend but solely as observers. They cannot intervene in the decisions of the Executive/Directors Board proceedings. A​ motion for holding a Special meeting may be requested by any member of the Executive Board and Board of Directors. Any​ member may request a Special Meeting with the support of at least ten percent of the General Membership. The​ Special meeting shall be scheduled and announced by the Executive President within two weeks following the receipt of the request. Notice​ of the Special Meetings of the Council shall be emailed to all active members who have provided an email address and printed copies will be mailed to those members that have not provided an email address. This​ notification must be completed at least two weeks before the date thereof, and such notice shall state the purpose for which the meeting is called and no other business shall be transacted at Special Meetings of the Council. To ensure scheduled meetings are effective and will achieve the objectives for which they have been organized, these are the requirements for attendance of each type of assembly. The President, Vice President, Treasurer, and Secretary or a duly designated substitute for each of these offices. All nominees must be present or can respond in absentia. At least one representative of each committee must be present. The Nominations Committee or suitable representatives must be present. The President, Treasurer, and Secretary or a duly designated substitute for each of these offices. Each Committee must be represented, but to make decisions at least two members of th EB and two of the BD are required. One Board member can represent two committees. SECTION 5. Whatever notice to Council members is required, communication will be sent to the last known address of the updated membership list of the Council. SECTION 1. All past acts, decisions, actions and resolutions taken by the founders of the Hispanic American Cultural Council, not contradicting the existing By-Laws, are fully confirmed and ratified. SECTION 2. Robert's Rules of Order shall govern the proceedings of all the meetings of the Council its Executive Board and Board of Directors. SECTION 3. Any proposal to borrow monies on the credit of the Council shall require the approval of two-thirds of the active Council membership present at a Special meeting duly called for that purpose. SECTION 4. The Council shall not be dissolved or otherwise have its existence terminated by its membership except upon the affirmative vote of no less than two-thirds of the active membership. SECTION 5. In the event of dissolution, all the remaining assets and property of the Council shall after payment of necessary expenses thereof be distributed to such organizations as shall qualify under section 501(c)(3) of the Internal Revenue Code of 1954, as amended, or to another organization to be used in such manner as in the judgment of a justice of the Supreme Court of the State of Connecticut will best accomplish the general purposes for which this corporation was formed. SECTION 6. No part of net earnings of the corporation shall inure to the benefit of any member, trustee, director, officer of the corporation, or any private individual (except that reasonable compensation may be paid for services rendered to or for the corporation) and no member, trustee, officer, shall be entitled to share in the distribution of any of the corporate assets upon dissolution of the corporation. SECTION 7. No substantial part of the activities of the Council shall be carrying on propaganda, or otherwise attempting to influence legislation (except as otherwise provided by Internal Revenue Code Section 501(h)), or participating in, or intervening in (including the publication or distribution of statements), any political campaign on behalf of any candidate for public affair. SECTION 1.These By-Laws may be amended at a Council Meeting or at any Special Meeting called for that purpose by a vote of not less than two-thirds of active members, counting the active members presents and those who voted using the absentee vote ballot, or by a well-documented e-mail process approved by the Boards, provided written notice of the proposed amendment, including the text thereof, shall be delivered to all the active members at least two weeks prior to the date of the meeting. I would like to send my absentee vote in favor ( ) or aginst ( ).